After a walk around the Huggate landscape, rest up and watch the world go by on the Huggate Poetry Bench, north of Huggate village and listen to one of our ‘Secret Art’ poems by famous Yorkshire poet Ian McMillian. The Huggate Poetry Bench is located close to the point where three dry valleys meet (Horse Dale, Holm Dale and Harper Dale), which are amongst the finest in the Wolds. Relaxing on the bench offers opportunity to experience the tranquillity of the landscape whilst enjoying wonderful views over the three valleys. Find out how it inspires you! We have rippled the earth with our desire to be here not there. We have driven the dale’s wedge of hush home between us. But you move, as we moved, in the ghost of water. A hare rips away from the dead, Thuds down the dyke and out into everywhere the grasses foam. Once you have relaxed at the bench turn back then head west along the length of Horse Dale over Open Access land, before turning left to return to Huggate. A walk around Huggate and the three dales also takes in the Huggate earthworks. These form part of a widespread system of Bronze Age earthworks, or ‘dykes’, which have provided archaeologists with much debate as to their purpose. They may have provided boundaries between different tribes, defence against invasion, a barrier to livestock or routes between different villages. Take a look for yourself and suggest your own theory! 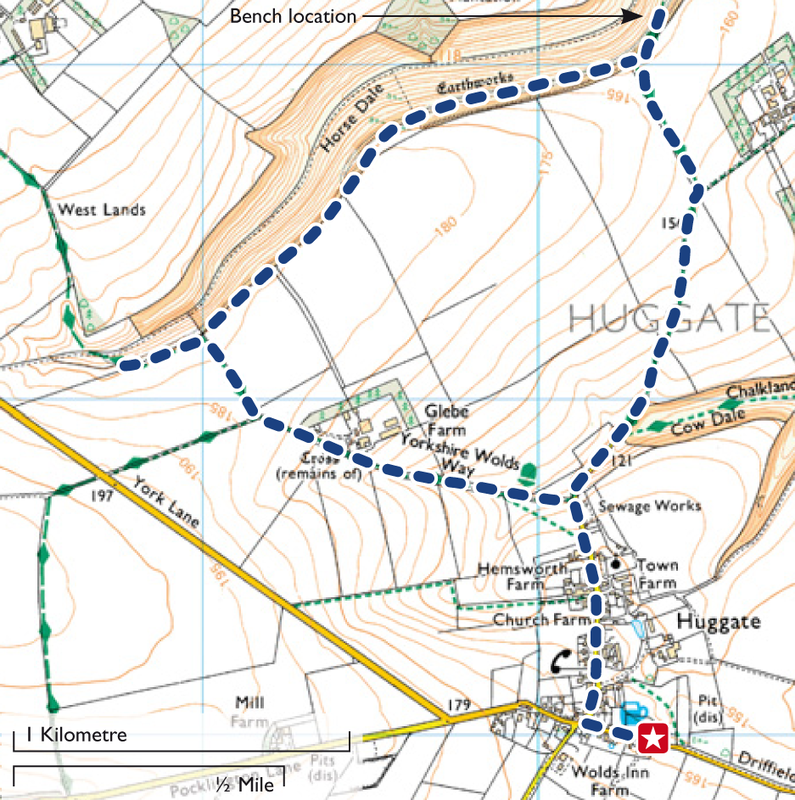 There is also opportunity along the walk to stop off at the village of Huggate, the highest village on the Yorkshire Wolds. Here you can enjoy refreshments at the Wolds Inn, visit one of the deepest wells in England or admire the beautiful Grade I listed church.